The club is a triangular head with a stainless steel body. The triangular shape head raises the MOI in the hybrid, and it also reduces drag for faster swing speeds. Yes, that's right -- it's aerodynamic. Plus, the perimeter of the club head has metal injection-molded weights. This further raises the MOI and makes this perhaps the most stable hybrid out there. The hybrid has Callaway's proven Variable Face Technology. This gives the face faster ball speeds with a sweet spot that covers the entire club face. And finally, the hosel is offset, giving the higher handicapper more control. The offset makes it much easier to square the club at impact. This helps alleviate that slice that's caused by leaving the face open. The club comes in five different lofts: 18-27 degrees. I recommend the higher lofts for you high handicappers. 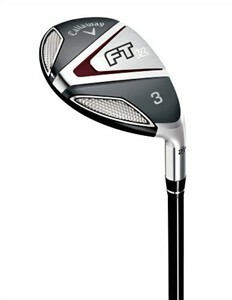 The higher-lofted club makes it easier to get the ball up and flying high quicker. Another hybrid I really like is the Callaway Big Bertha Heavenwood Hybrid. You can get this hybrid with 32 degrees of loft!